Educational System in Thailand is given mainly by the government of Thailand under the Ministry of Education. The education begins from pre-school up to senior high school. The government, under the constitutional act of education, provides free basic education for all for twelve years and nine years of minimum school attendance is compulsory. Formal education in Thailand is divided in to basic education of twelve years, and further higher education. Basic education comprises of elementary education for six years and secondary education also, for six years. Secondary Education is further separated into lower-secondary (for three years) and upper-secondary (for three years). The responsibility of formal education lies on the shoulders of the state government. Tertiary education in Thailand is better defined as post-high school education. It is provided in three forms: “Under” bachelor’s degree, bachelor’s degree and postgraduate degree. “Under” bachelor’s degree qualifications there could be a diploma, a vocational diploma, a diploma in Thai dance, or an art diploma. A bachelor’s degree includes a higher diploma in teaching. A postgraduate degree consists of graduate diploma programs, master’s degrees, higher graduate diploma programmes and doctorate degrees. Vocation training in Thailand starts from the senior high school. The secondary education is divided into two branches- General and Vocational Education. There are over 60% of students following general education. However, the government is taking efforts to balance the ratio between general and vocational studies. Currently 412 colleges are governed by the Vocational Education Commission (VEC), of the Ministry of Education with more than a million students following the programs In 2004. Additionally, approximately 380,000 students were studying in 401 private vocational schools and colleges. According to the statistics of vocational training presented by the Ministry of Education display that there are over 415 colleges run by public sector and 427 vocational schools and colleges run by the private sector all over the country. Level 1: The Certificate in Vocational Education, known as Bor Wor Saw. It is pursued during the upper secondary period. Level 2: The technical Diploma, also known as Bor Wor Chor. It is pursued by students after leaving school. Level 3: The Higher Diploma. It is a university level programme that may offer a bachelor’s degree. Public and private sector schools both play a major role in the Dual Vocational Training- DVT. In the year 1995, the government of Thailand established the department of Vocational Education based on the educational system in Germany. The organization introduced the concept of dual vocational training in... ...which students obtain knowledge at school and simultaneously can practically apply it in the outer world. There are several companies that offer internships for students so that they can get there vocational training along with basic education of schools. The Dual Vocational Training offers certificate as well as degree programs. The duration of vocational training in Thailand is three years. Out of the three years one and a half year is devoted in school, and the other half for practical training. The companies usually, ask the students to come for two days in a week. Certificate Level – of two years, for skilled workers. Those students who are above 15 years of age and have completed Matthayom 3 (Grade 9) are trained. Diploma Level- of two years for technical workers. Those students who have completed their graduation, have completed 12 years of education and have obtained the Certificate of Vocational Education are eligible to apply for the course. The scheme of Dual Vocational Training is different from other regular internship programmes. In the regular internships students are assignedto work on irrelevant jobs and are not paid for it. However, the dual education programme allows the students studying in the vocational training programmes to do field work while benefiting from an allowance to cover living expenses or free accommodation along with their studies and they are given compensation for their contributions from the company’s income and profits. In other words, they work as temporary employees. Schools directly work in partnership with the private sector companies in order to draft action plans and set goals for students that they should meet. At most of the times, the company gives permanent job to the interns after completing their graduation and the dual programme. Therefore, those students who have completed their nine years of education can enrol with a technical college where they study vocational subjects and side by side work in the companies. Currently there are over 415 colleges, that are divided into 13 specialized fields, working under OVEC (Office of the Vocational Education Commission. These colleges mostly award vocational certificates in various subject areas. 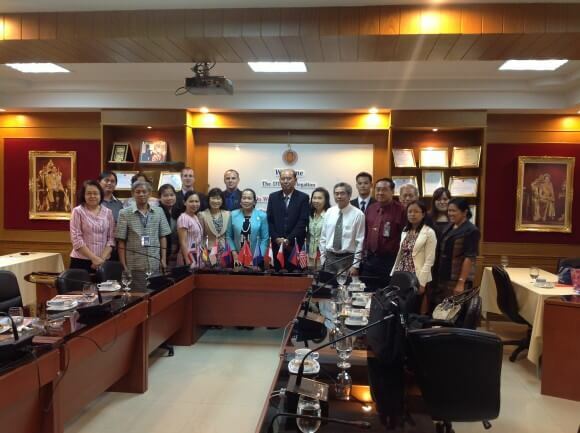 Thailand places high importance to vocational training and education for human resource development. There are many government policies that focus on improving the techniques, skill, and productivity of work force. Government has developed several strategies like “learn and earn” that contribute to increasing popularity of vocational courses so that more and more low income families can be supported. One of the successes of government in this area is the establishment of the “Fix It Centres”. The purpose of these centres is to create vocational training and education more appropriate and jointly beneficial for students as well as local communities. It helps students to achieve hands on experience in work field and earn a small salary. Another benefit of these centers is to bring students into the community, develop a positive attitude towards vocational training and education,increase awareness on the types of opportunities in vocational skills training that are available for them, and encouraging them to participate in national and international vocational competitions. Hi, I am a highly qualified Vehicle Upholsterer married to a Thai for more 12years living in Western Australia. I also have a Diploma of Teaching for training apprentices and currently operating my own business and wishing to come and live in Thailand and see what can be done for me to part of passing on my skills to Thai people . I would like to train people to undertake repair , pattern making, design and manufacture of all types of upholstery for cars, trucks, boats, aircraft,furniture and canvas work. All I need is a contact within the Thai training institutes that I can show my interest to train and further skill in my trade area please. Can anyone assist me ? I would love to live in Thailand with my wife and pass on my wealth of knowledge. I have done Ph.D. in Renewable Energy Systems from top Indian university in 2011. I have a Certificate of “Vocational Education Leadership” Training Program from TAFE, Australia from June 2014 to Feb 2016. I have a teaching experience of total 31 years Post Graduate, Graduate and Diploma levels of Electrical Engineering. I am presently working as Associate Professor & Director of Community College, running vocational courses of Diploma Level, Bachelor Level and Master Level. I will retire from my job next year. I want to get a suitable job in Thailand in any Vocational College/University after my retirement. Is there a website where schools providing vocational programs are listed, specifying which specialties each school offers? I was looking for the same thing, unfortunately, no such updated list exist. I am looking for vocatonal training for a 23-year old male. He is keen, but unsure of what or where to go. The website is great, but, I don’t see a Thai version, which he needs to see. Can you help? This page is not give general information about vocational training in Thailand, we do not have a Thai version of the site. Sorry Gabriel, we don’t have any guide available for vocational training in Thailand.